In a recent report released by ACEEE and Energy Efficiency for All, Lifting the High Energy Burden in America’s Largest Cities, we measured energy burdens in 48 of the largest cities in the United States. Energy burden means the percentage of household income that goes toward energy costs, and we looked specifically at utility energy bills (transportation energy costs are also a significant household expense, but it was outside the scope of the analysis). We found that low-income, African American, Latino, and renters pay up to three times more than the average household on home energy costs. Higher energy burdens have real implications on the health and wellbeing of families and individuals. For example, the median income for low-income households in Memphis is around $19,000, and we found that they can spend upwards of $2,500 to $4,700 a year on their utilities. Families like these households, who have to devote higher proportions of their income to utility bills, may have to make trade-offs between heating and cooling their homes and affording other important necessities, such as food, medicine, and childcare. Lower incomes, less efficient housing, and limited access to energy efficiency programs can explain the higher energy burdens faced by these groups. We found that even though these families paid less overall on energy bills, they paid more per square foot, which indicates the relative inefficiency of their homes. When analyzing energy burden, it’s important to look beyond averages and medians in order to better understand the burden faced by those worst-off economically. In this study, we also looked at the energy burden “quartiles” for each group (quartiles represent the middle value of the lowest half and upper half of the dataset). The figure below illustrates the energy burden quartiles experienced by low-income households, indicated by the orange, green, and blue points. The dotted green line indicates the median energy burden for all households in our study, not just low-income households. 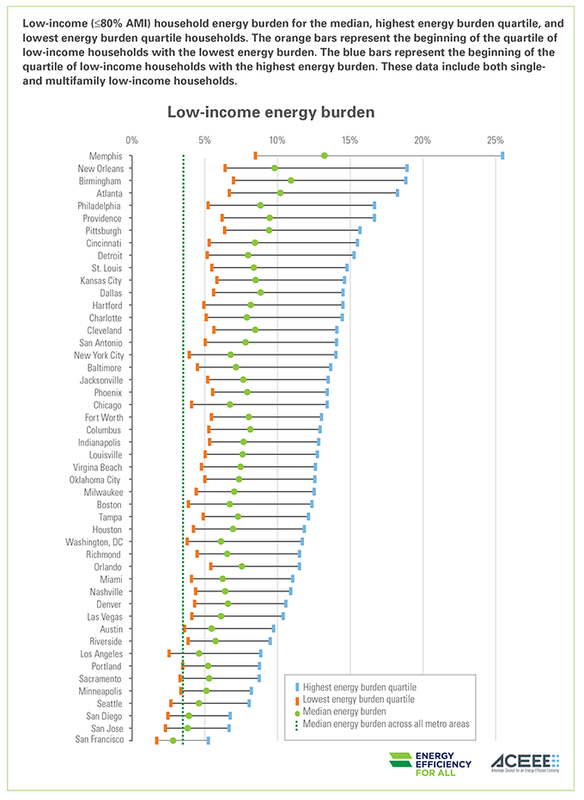 Three-fourths of low-income households experienced an energy burden greater than the orange point (the lowest burden quartile), one-half of households experienced a burden greater than the green point (the median), and one-fourth of households experienced a burden higher than the blue point (the highest burden quartile). Take New Orleans for example: a quarter of low-income households in New Orleans experienced an energy burden greater than 19%. This is not unique. In 17 cities, a quarter of low-income households experienced an energy burden greater than 14%. This represents a significantly higher energy burden compared to the median energy burden across all cities in our sample, which was 3.5%, suggesting these low-income households devote a significantly higher portion of their income to utility bills. What next? States, cities, and utilities can take action to address high energy burdens in their communities. Utility-funded energy efficiency programs are an underutilized strategy that can complement bill assistance and weatherization programs. To address high energy burdens, we suggest improving and expanding low-income utility programs by following the best practices laid out in our report, Building Better Energy Efficiency Programs for Low-Income Households. The same applies for the programs that serve multifamily buildings where building owners and managers experience unique barriers to upgrading housing stock with traditional efficiency measures and the majority of low-income residents are renters. We outline best practices for the delivery of multifamily energy efficiency programs in our report, Apartment Hunters: Programs Searching for Energy Savings in Multifamily Buildings. Utilities should also collect, track, and report demographic data on program participation in order to ensure that efficiency programs are meeting goals. Cities and states can also work to ensure that cost-effectiveness testing of energy efficiency programs include multiple benefits and also that strong low-income savings goals are in place for both investor- and municipally-owned utilities. The Clean Power Plan also offers an opportunity for increased investment in low-income energy efficiency programs through the Clean Energy Incentive Program. Local stakeholders have many policy and program options to help those most in need in their communities to reduce their utility energy costs and alleviate energy burdens. For more information on the topics covered in this post, see our low-income energy efficiency programs and multifamily homes topic pages. Data Points is a blog series focusing on the graphs and other images that tell the energy efficiency story.